Your baby will grow quickly in the next couple of years. Babies learn how to do something new almost every day, especially in the first six months of life. With each new developmental stage that your baby reaches, you and your family will celebrate with wonder and joy. While not every baby follows an exact timeframe for reaching those new growth stages, the following gives a general idea of what you can expect your baby to do in the first six months of his life. 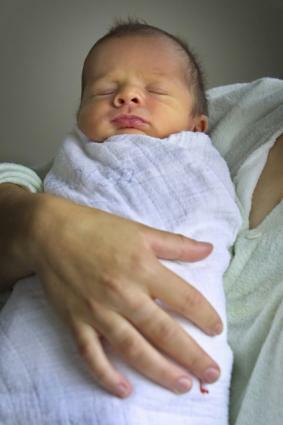 You may think that your newborn baby isn't aware of much in the first few weeks of his life. Nothing could be further from the truth, however. Yes, he does sleep a large amount of the day, but when he is awake, he is learning about his new world and about his family. Your infant's eyesight is still developing, and he can only focus on objects that are approximately eight to twelve inches away from him, as noted on Family-Friendly-Fun.com. Faces are probably among his favorite objects to look at, so be sure you hold him a short distance away from you as you talk and sing to him. You may notice his eyes become crossed at times as he tries to focus on you. This is typically normal, though. According to the American Pregnancy Association, newborn babies prefer objects that are colored in black or white, so while you may love that pastel colored mobile which matches your little girl's adorable nursery, she will much prefer a black, white, and red mobile that features various geometric designs, circles, and/or faces. You can help stimulate your baby by placing toys featuring these main colors within six inches of her face. You may be surprised to discover that she stares intently at them for several moments at a time. Don't overdo it, however. When she begins to look away from the object or you and begins to fuss, this is her way of communicating to you that she has had enough stimulation for a while. Although it is important for you to place your infant on his back when he is sleeping to reduce the risk of SIDS (Sudden Infant Death Syndrome), you should give him some tummy time every day. Placing your baby on his tummy helps him strengthen his head, neck, chest, and arm muscles, and it is important that he has this exercise time each day. Get down on the floor and play with your baby. He may surprise you with a wonderful smile at around six weeks of age. By the time your baby is three or four months of age, she will be very generous with her smiles and giggles, and you'll find yourself doing the silliest things to coax another laugh from her. She will enjoy this playtime as much or more than you, so continue to interact with her often during the day. By this age, your baby's eyesight has matured, and she will enjoy looking at brightly colored objects of all colors. You should have already introduced her to the world of books. Look for books made of sturdy cardboard, cloth, or rubber, so that she can examine them herself. She still needs plenty of tummy time, and don't be surprised if she flips from her front to her back, quite by accident, as noted by Baby Centre UK. This typically will not occur until she is a little older, but some babies are able to flip as early as four months of age. You should continue to place her to sleep on her back, though. Your baby's hand-eye coordination is developing by leaps and bounds, and you can encourage him by offering brightly colored educational toys and books that are age appropriate. Try holding them just out of his reach, and watch him reach for them. He'll begin trying to bat at these objects, and this is a preliminary movement to handling them adeptly on his own. 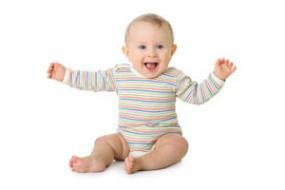 During the fifth and six months of your baby's life, you may discover that she is becoming much more mobile. While she may not actually have the crawling technique down, she may still be able to move across the floor and her bed. It is important that you never leave her unattended, as a baby can wiggle off a bed or changing table quickly. Some babies never actually crawl. Instead they creep across the room, scooting backwards, frontward, and even sideways like a crab, according to WebMD. Your baby may also be able to sit up with assistance. You can place a u-shaped pillow around her or several pillows to protect her back and sides. You should also place several colorful toys within her reach or place a toy gym in front of her. She will enjoy playing with these toys as she sits upright. Sometime in between four and six months of age, your pediatrician probably told you to begin introducing solids to your little one. Thus begins the adventure of food exploration for your baby, and what an exciting adventure it will be for her! Be sure you wait a few days in between introducing each new food to determine if she has any food allergies. Don't forget to read to your baby, sing him songs, and play games with him on a daily basis. He will love this, and it will help to stimulate his intellectual growth. You are also helping him to develop his language skills, too. Your baby will reach many more developmental stages in the next few years, and you will enjoy watching the wonder of his development. Along the way, give him plenty of hugs and kisses, and remember that you are your child's biggest fan.